or from $20 per week and 0% interest. Be the envy of your neighbours and make your keeping chooks dream a reality, whether it’s just for a couple of fluffy-butts meandering around or a gorgeous flock of up to 20 chooks, the Mansion™ coop will house them in comfort and safety – and with a walk-in run, you don’t even have to bend your back to get inside. After your first morning trip out to collect those warm, freshly-laid pearls of golden goodness – you’ll know you made the right choice with a Backyard Chicken Coops Mansion™. Make egg collection easy with the Mansion™ Coop! Easily access your coop’s 6 large nesting boxes through their external lids. Up to 20 chickens can happily lay their eggs in privacy and comfort. Our purposefully designed 50mm round perches suit a chicken’s natural perching and roosting behaviours. Your chickens will rest easy with 8m of perching space set at the perfect height for your hen to roost and rest securely. • We exclusively use slowly kiln dried A-grade timber, so your coop lasts and withstands the harsh Australian climate. 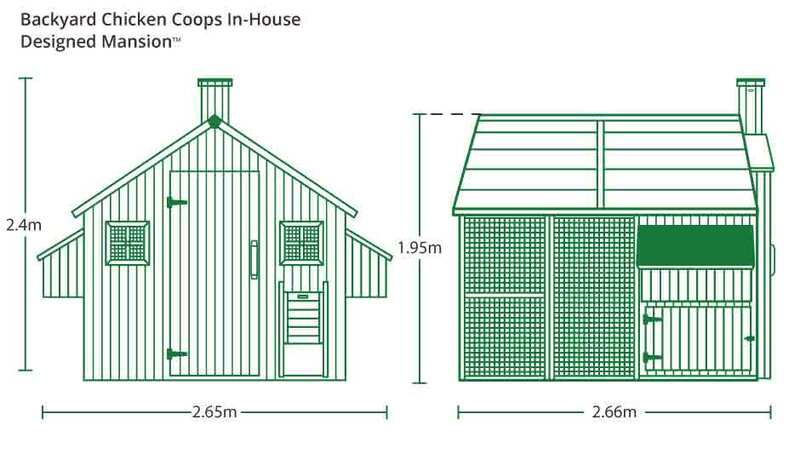 • Our chicken coop models are up to three times heavier than others you’ll find on the market. Our choice of timber for strength and durability lets us offer you a full 12 month warranty. • Backyard Chicken Coops Mansion will arrive in natural timber, ready to be painted & styled however you like! Painting your chicken coop with suitable exterior house paint provides a protective and long lasting finish. Your family can join in the fun of making their chook coop a unique hen home! • Strong 10mm x 10mm galvanised wire mesh and sliding bolt locks on ventilation and entry points will help prevent predators, snakes and vermin from entering your coop. • Make sure you pick up some Wire Mesh Flooring, an Auto Door Opener, and a Predator Sensor Light to keep your chickens well protected. • A well ventilated and draught-free chicken coop is essential for happy and healthy hens. • Create the perfect environment for your chickens with the Mansion™ Coop’s meshed sliding windows, high ceilings and capped off ventilation chimney. • Waterproof rubber asphalt roof panels keep your hens safe from the elements. • Oversized eaves encourage rain to fall off and away from your coop, keeping your flock dry and comfortable. Slide out cleaning trays with easily removable 30mm deep steel inserts make cleaning your Mansion™ Coop convenient and simple. • All the hardware you need is included with your coop and comes clearly labelled. • We only use galvanised components for longevity and durability. • Assembly is easy with ready-to-go features like pre-drilled holes and pre-attached fittings, including locks, hinges, latches, wire mesh and doors. Your Mansion™ coop goes up easy with a power drill, a phillips head drill bit and a pair of helpful hands. Have an assembly question? Get in touch! Contact our customer care team and we’ll help you with any assembly support you need. Assembly. Painting. Chickens! We take care of everything for you. We offer assembly and painting services from as little as $479* and we can even help you meet your new flock with a chicken sourcing service. 5.66m long x 2.65m wide with nesting boxes. How do I connect the Mansion to the Run? Once your foundation is setup and you have completed the setup of the Mansion coop, you simply assembly the run and slide it into place, as it sits securely under the lip of the Mansion coop. If you move house you can simply unscrew the panels and take it with you! In terms of moving it around your yard, at 200kg it is designed to be kept in a fixed location on a solid and secure base. You can very comfortably house from 2 to 20 chickens inside our Mansion coop, however, they will still need free-ranging to keep them happy and healthy! It all depends on which breeds you choose. Can I add the Mansion Run later on? What does the inside of the Mansion look like? It has two by sets of four perches on each side of the coop with an open area in the middle where they have a door to access the ramp down into the ground of the Mansion coop. The perches, cleaning trays and nesting boxes are up off the ground so the chickens have full access to roam around underneath, where you also have another two access doors. While assembly is quite simple - we provide full colour instructions, follow-along video and 7 day assistance - if you are short of time and would prefer someone to do it for you, we'll organise the assembly of your Mansion Chicken Run from $479*. We are proud of our products and offer a one year warranty. If you lose or damage a piece, and need it replaced, we are here to assist you 7 days a week! You can also purchase an extended warranty. Take home the Mansion Chicken Coop today from just $80 a month with ZipPay or using OpenPay, approval in just minutes. Simply put down a 20% deposit of $369 and pay the balance over 6 x easy payments of $246*. In addition to this we also accept PayPal, Debit cards, Credit cards in our online secure checkout, or over the phone. Buy Now, Pay later, Credit cards, Debit cards and PayPal, we accept it all! Approval in minutes on OpenPay, it's like a take home layby! Simply pay a deposit of $398, then installments of just $65 per week*. If you prefer a little more flexibility and zero deposit, ZipPay is the way to go with payments from just $80 a month.